A man investigators say has been dealing marijuana, coke, oxy, and Adderall out of a Capitol Hill apartment for years has been arrested and charged with federal drug crimes after being nailed by Seattle Police detectives working in conjunction with Homeland Security and the King County Sheriff’s Office major crimes unit. An April 2017 overdose death in an E John apartment brought down the man prosecutors say was the kingpin opioid dealer on Capitol Hill until his arrest, prosecution, and sentence this week to twelve years in prison. “A sophisticated trafficker, trading in cryptocurrencies, working with overseas suppliers, knowing not to deposit large quantities of cash into financial institutions, and amassing an arsenal of weapons and a security system to protect his assets and supply,” Smith was sentenced this week to 12 years in jail in a plea deal following an investigation that traced more than 70 shipments of fentanyl analogues to the Des Moines Memorial Dr S dealer from China. A Capitol Hill parking lot was the scene for a big drug bust last Tuesday afternoon that authorities say resulted in the seizure of more than 300 pounds of methamphetamine. 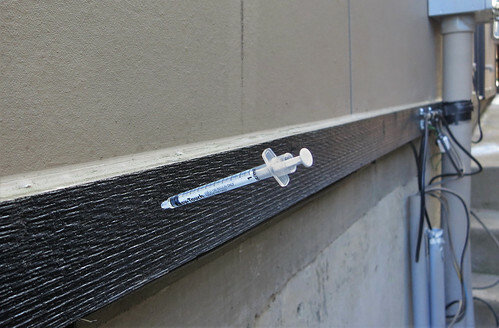 In its first 15 months of operation, Seattle Public Utility’s pioneering Sharps Collection Pilot Program has collected and safely disposed of 32,012 hypodermic syringes, improving both the safety and cleanliness of the city’s neighborhoods. Since February, people disposed of 26,647 syringes in nine SPU sharps disposal boxes around Seattle. (See attached map.) Another 5,365 needles have been removed from public property since the program began, in August 2016, in response to 1,113 complaints. Complaints were filed online, with the City’s Find It, Fix It app, or phoned in to (206) 684-7587. Seattle Fire medic units rushed to treat two people who overdosed late Saturday night inside a Pike/Pine bar. While many of Capitol Hill’s OD emergencies happen in stairwells and parking garages, the emergency response Saturday just before midnight came in the middle of the Purr Lounge on 11th Ave where one person was reported down inside the bar unconscious and unresponsive. At the end of January, King County Executive Dow Constantine and Seattle Mayor Ed Murray announced they were moving forward with all of the Heroin and Prescription Opiate Addiction Task Force recommendations to battle the heroin epidemic at a local level, including launching two safe consumption sites. Officials are currently gathering data and information and meeting with communities to determine where the two sites, one slated for Seattle and one for greater King County, should be located.